“I think you’ll feel better if you get some space and take some deep breaths,” I said. He bent down and picked her up. Ty carried Abby upstairs to her bedroom to lay her on the bed. I heard the door shut, a thud as she jumped off the bed, and footsteps running to her door. 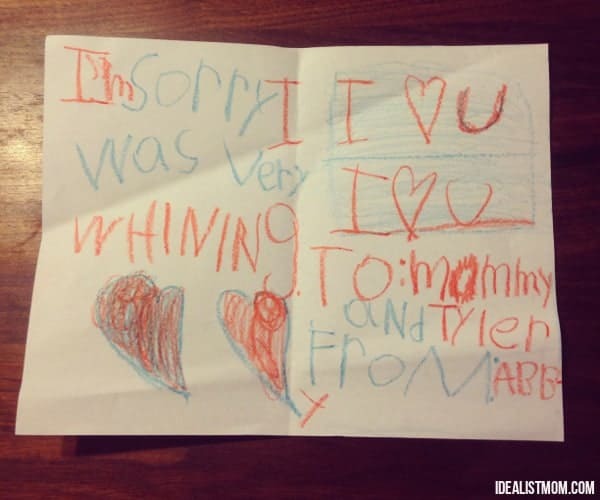 “Abby,” Ty said. In a calm, soothing voice. Where was this man getting his patience? Her sobs were muffled by the door. Were her sobs slowing down? “Sit down with me,” he said. So calm. I couldn’t hear the answer. Ty took a deep breath. A pause, then he started talking more quietly. So quietly I couldn’t make out what he was saying. First, I saw Ty walk down the stairs. Then Abby behind him, her eyes puffy and red. “How about cheese and crackers?” Ty asked her. He turned to me. “We’re getting a snack.” He smiled. I looked at Abby, and somehow, she was smiling too. That man has magic in his veins. After Ty coaxed Abby out of her meltdown and filled her belly with a snack, we all sat around and talked about what had happened. No sobbing, no whining. Abby told us how she felt, we told her how we felt, and we all listened to each other. He got thrown into this parenting gig when Abby was three – not a terribly charming age. On top of which the poor kid was still learning to split her life between two separate houses. But Abby was smitten with him, from the very beginning. I’ve loved watching them grow closer over the years. She’s always there to help him in the kitchen or the garage, and he’s always there to make her laugh. About an hour later as we were all getting ready to head out the door for the party, Abby walked up to me and Ty. She held a folded piece of construction paper out to me. “It’s for both of you,” she said. I took it from her and opened it up, with Ty looking over my shoulder. We were quiet as we read it. Then I looked up and smiled at my sweet girl. Last year for Father’s Day, I wanted to find something meaningful for Abby to give Ty. Something that didn’t come from the store. Something to honor the special bond they have. I had no trouble finding a ton of super cute printables and card ideas for Father’s Day. But searching for “stepdad” yielded a bunch of grown-up sounding cards. And narrowing the search to “stepdad,” “Father’s Day,” and “printable”? Abby loved answering the questions, and then we wrapped it up. Later, when Ty was reading what Abby said about him, he brushed his thumb under his eye a couple times. I doubt Abby noticed, but I did. Stepdads and single dads and all the other kinds of dads of the world – Happy Father’s Day! Download the gift. 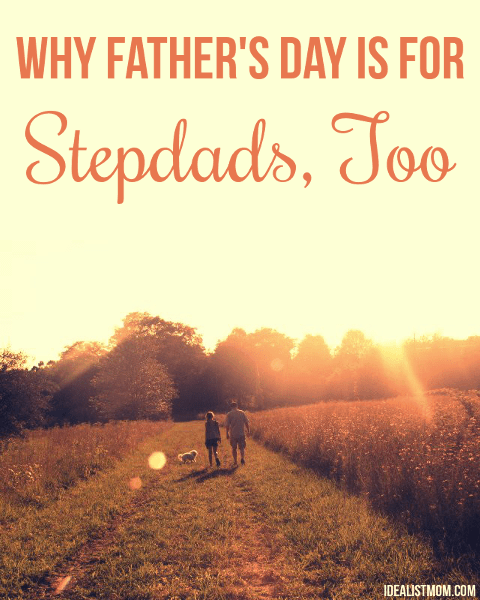 You’ll get the stepdad and dad printables, plus join my weekly newsletter! Just click here to download and subscribe. Interview your child and write down their adorable answers. The second page is blank for your child to draw a picture or write a message. Enjoy! How do you celebrate Father’s Day with your kids? Share your story in a comment below! What a thoughtful card Kelly! 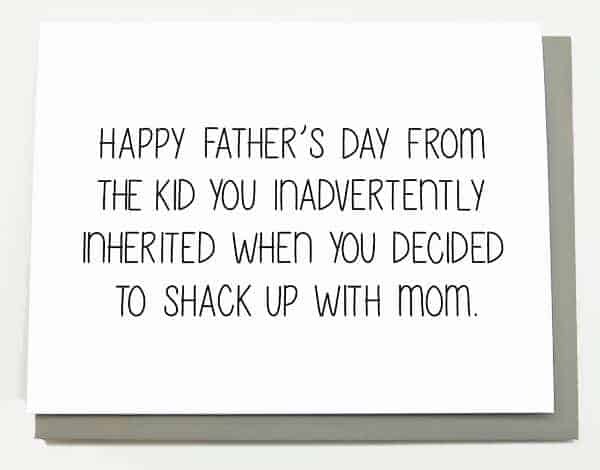 Now that you mention it, I don’t remember seeing too many cards or gift ideas for step dads or step moms either. Love the one you created. Chris, I’m so glad to hear the Father’s Day gift resonated with you. :-) And I can’t believe I was like that with Abby – what a horrible lesson for me to teach, that a gift isn’t good enough if it isn’t expensive? Oops. *blush* I’m going to join you on your quest to find the happy medium! Love this!!! Thank you so much! Printed it out for my daughter to fill out as the perfect gift for her almost step dad. Even she thought it was the perfect gift. Hey Kelly! 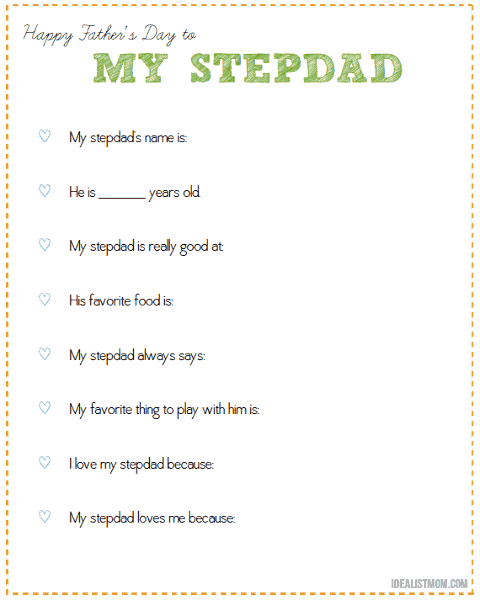 I love this printable…went through the steps to subscribe and download the stepdad version and only received the dad version. Can you help please? Hi Sara! The printables will download as a compressed ZIP file. When you double-click to decompress the ZIP file, you’ll get two PDFs — one for the dad version and one for the stepdad version. Hope that helps! Thank you so much for this! I have been searching everywhere for something for my son and this is PERFECT!